There’s something to be said for flavor combinations that kids love. Peanut butter and Jelly? Awesome. Tater Tots and ketchup? Move over Timmy, we want some too. 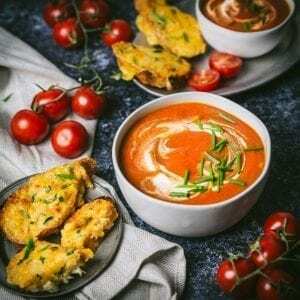 Tomato soup and grilled cheese? Happy dance. And while, yes – you can heat up a can of Campbell’s and grill up some white bread with a slice of American cheese in the middle – for most adults it’s going to taste a little blah – somehow both too sweet, too salty and still bland. And while we’re not sticklers or anything, we try to keep our processed food intake to a minimum, especially when cooking a recipe like this from scratch is easy and gives you wildly better-tasting results, to boot. Save your fresh tomatoes for salad – Our Creamy Tomato Soup takes help from the pantry. A few summers ago we made tomato soup using fresh Roma tomatoes – roasted in the oven to concentrate their flavor. The soup was really tasty but it required a lot of tomatoes which meant that even in the summer it was kind of an expensive undertaking for a humble supper. Right now it’s March and fresh, ripe, local tomatoes are still a whistle and a wish away, so we got help from the pantry – in the form of perfectly ripe canned tomatoes (peeled whole tomatoes or crushed are best. Avoid diced which use added chemicals to help the chunks stay chunky). But it’s okay, because honestly, canned tomatoes are awesome. They’re picked at peak ripeness and the good varieties have nothing added other than a little salt. They’re affordable, available year round and already peeled. What’s not to love? However we did want to amp up the tomato-ness so we tried adding tomato paste but the results were a little too sauce-like in flavor. Then a lightbulb went off and we dusted off a jar that had been sitting on the back of the pantry for far too long, sun-dried tomatoes. Now, this ingredient may have some of you wondering if the 90s are back. It’s true that the ubiquitous sun-dried tomato was criminally over-used (salads! sandwiches! cereal!) but when used well, they’re a great way to add concentrated, slow-cooked tomato flavor to a quick-cooked dish. So with two our varieties of pantry-friendly tomatoes set, we can move on the rest of the ingredients: slow cooked onions (the backbone of every great soup), fresh herbs (we used thyme but basil would be a great choice in summer), good stick (either chicken or vegetable) and a swirl of rich, creamy mascarpone cheese (cream cheese or creme fraiche work well too, as would just a splash of heavy cream or even half and half). 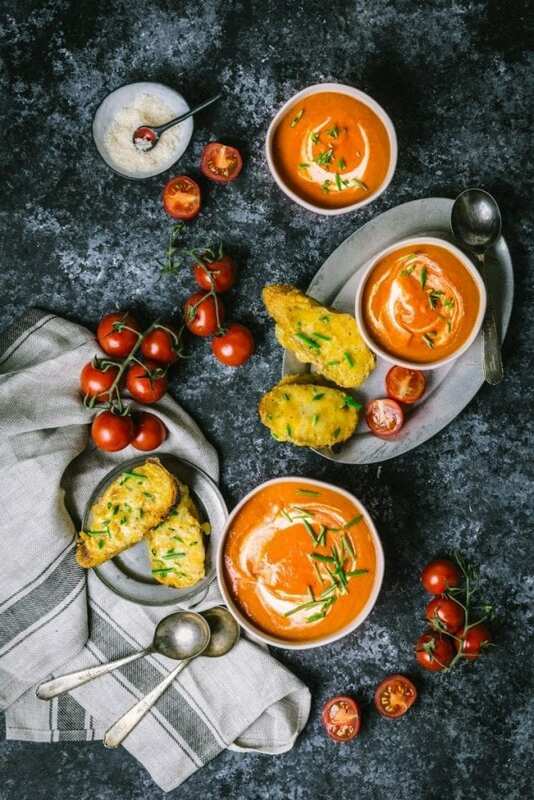 Can you smell the garlic butter cheesy toast just begging to be dipped into this creamy tomato soup? We can because we’re eating some right now! Don’t hate. But what about the second element of this recipe? 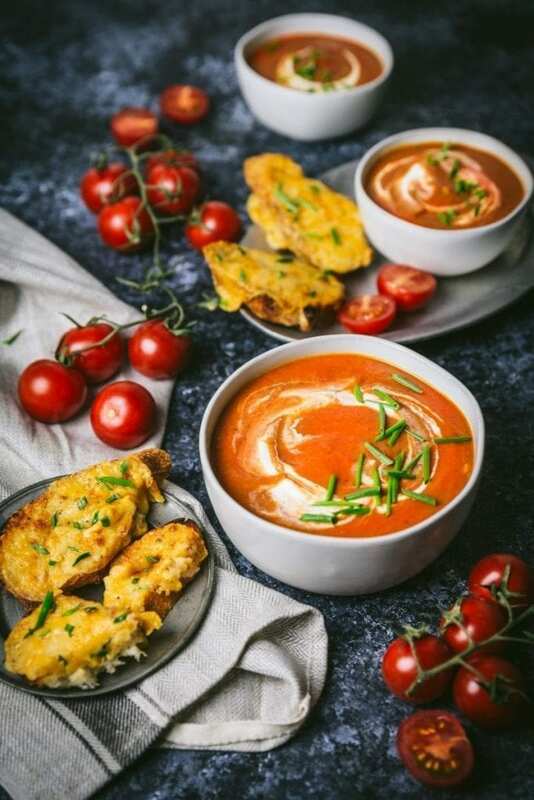 A lot of you – and you know who you are – will have seen the title of the article and taken a look at the first image and said “It’s all very well going on about tomato soup, I’m sure it’s delicious, but you had me at roasted garlic cheesy toast, give it to me now”. We like to keep our readers happy, so let’s talk about the toast. It’s frigging delicious. That is all. It’s like a cross between the best garlic bread you’ve ever had (buttery, garlicky, decadent), crossed with the best grilled cheese (two kinds of cheeses, gooey, but with delicious little crackly bits). We’re not kidding when we say we’re a little bit addicted. And making it couldn’t be simpler. Roast a couple heads of garlic until the cloves turn meltingly soft and golden. This tempers the harsher garlic notes leaving a sweet, mild garlic flavor. Mash that garlic with some softened butter, two kinds of shredded cheese (sharp cheddar for unbeatable flavor and gruyere both for its nutty flavor and because it melts beautifully). Season it lightly with salt and generously with pepper and spread the mix onto slices of good French baguette. Lay them on a foil-lined baking sheet and broil them until the cheese melts and the tops get a few little brown spots and gaaahhhh, drooling just writing about it. Note: If you don’t have the time to roast the garlic (or just prefer the flavor of raw), you can substitute 2 to 3 minced or grated cloves (about 1 1/2 teaspoons) for the two roasted heads. In an enameled (non-reactive) 5- to 6-quart soup pot or Dutch oven, heat oil and butter over medium heat until butter foams. Add the onions and cook, stirring occasionally, until onions are soft and translucent but not brown, about 8 minutes. Add garlic and sun-dried tomatoes and cook for another 2 minutes. Add the flour and cook, stirring for 2 minutes. Stir in broth, canned tomatoes (crush lightly with spoon if using whole), honey, thyme, and ½ teaspoon salt and ¼ teaspoon pepper. Bring to a simmer over medium-high heat, stirring often. Reduce the heat to low, cover, and simmer for 30 minutes. Let cool briefly and then purée with a stick blender, or in two or three batches in a standing blender or food processor. Return soup to the pot, if necessary, and turn heat to low. Add mascarpone cheese and stir until melted and fully incorporated. Season to taste with salt and pepper. Preheat oven to 350ºF. Line a baking tray with foil or parchment. Remove loose papery outer skin from garlic bulbs, but don’t separate cloves. Cut off top of garlic bulbs, exposing ends of individual cloves. Place both heads of garlic, cut side up, onto a square of foil and drizzle with a half tablespoon of oil on each. Tightly cinch up the foil and roast for 30 to 40 minutes until heads are light brown and very soft. Set aside until cool enough to handle. Squish roasted cloves out of the skins into a medium bowl. Add cheeses, butter, salt and pepper. Mix until combined. Switch oven to broil and place rack 5 to 6 inches from heat. Evenly spread the cheese mixture onto bread slices. Place slices on lined tray, cheese-side up and broil until cheese is melted and browned in spots, about 3 to 5 minutes. Remove from oven, scatter with herbs and serve with soup. In a sealed nonreactive container, tomato soup will keep up to 1 week in the refrigerator or 6 months in the freezer. This recipe and the abundant leftovers got me through this gray last week of March while fighting off a cold. I’ll add if you have lots of leftover soup and maybe some leftover shredded cheese but no more baguette that the gruyere melted into the reheated soup also tastes excellent. Thank you! So, 2 (28oz, 830ml) cans whole peeled or crushed tomatoes means 830 ml total of crushed tomatoes, right? Not 1.66 L.
A little difficult to read the ingredient list with the back ground that was chosen.